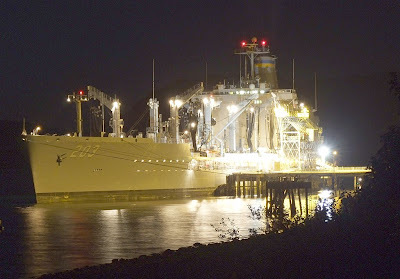 Lying alongside the NATO fuel jetty at Loch Striven, the US Navy's Fleet Replenishment Oiler USNS LARAMIE is here to act in a support role for the ships taking part in Neptune Warrior 072, which is due to start on Monday. This ship, a member of the 'Henry J Kaiser' class, was modified during construction to become one of the first US Navy tankers to feature a double-skinned hull to comply with the latest anti-pollution regulations. Built at the Avondale Shipyard at New Orleans, she was completed in 1996 and she has a fully loaded displacement of 40,900 tons. LARAMIE is part of the Military Sealift Command's Atlantic Command. Nice one, one of my favourite view points ! !